Large commercial jets arriving on smaller Runway 25R because LB Airport temporarily closed its main diagonal runway 30/12. And between now and next summer, occasionally there may be more temporary closures as Airport officials check out reports of unusual occurrences on the aging main runway. On Aug. 28 from about 4:00-5:00 p.m. LB Airport conducted "inspection and possible minor repairs" on the main Runway 30/12 and a similar inspection took place on Aug. 29 from about 4:30-4:45 p.m.
LB Airport Public Information Officer Sharon Diggs-Jackson told LBReport.com the public can expect additional temporary closures of main Runway 30/12 from time to time over the coming months because Airport officials check the condition of the aging runway when they get reports of anything unusual. A major repair project for Runway 30/12 is expected to begin in November 03. City management has chosen to keep the Airport open (instead of finishing the repairs in possibly less time by closing the Airport for a few days)...meaning large aircraft will be diverted (by the FAA) for seven full day Saturdays (Fri. 11 p.m.-Sun. 7 a.m.) during June-Aug. 2004. Dates are currently tentative, subject to change. Ms. Diggs-Jackson said the seven Saturdays are expected to be a maximum, with fewer possible. 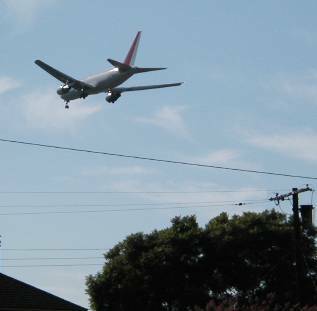 25R, a smaller neighborhood runway roughly 60% the length of main Runway 30/12, usually handles smaller planes. It aligns roughly with Monlaco Rd on approach and 36 St. on takeoffs. Diverting the large aircraft onto 25R will mean takeoffs over the Los Cerritos neighborhood and approaches across the northern part of ELB. An alternative to the diversion would complete the repairs in possibly less total time by closing the airport for a few days. This is apparently not being pursued by City Hall because some airport businesses might find it too disruptive for them. To our knowledge, no LB Councilmember has questioned the health, safety and other impacts of diverting the large aircraft onto shorter runway 25R. .
As previously reported by LBReport.com, in May 2002 the City Council voted 9-0 (Yes: Lowenthal, Baker, Colonna, Carroll, Kell, Richardson, Grabinski, Webb, Shultz) to get a report discussing the Airport's impacts on residential homeowners. Over a year later, the report has not been presented.